CBO Estimates $1.1 Trillion Federal Deficit : The Two-Way The deficit is slightly smaller than last year's, amounting to about 7 percent of GDP or two points lower than last year. Taking into account all the budget legislation passed in the last year, the Congressional Budget Office says the country will run a $1.1 trillion deficit in fiscal year 2012. The CBO reports that is nearly 7 percent of the United States' GDP, but is "nearly 2 percentage points below the deficit recorded in 2011, but still higher than any deficit between 1947 and 2008." And, then, a look at the projected fiscal situation of the country through 2022. the bottom line is that the country will be running a sizable deficit for the next decade. But the CBO analyzed what would happen if congress allows the expiration of tax cuts ennacted in 2001, 2003 and 2009. The brown assumes those tax cuts are extended and the blue assumes congress allows those taxes to expire. 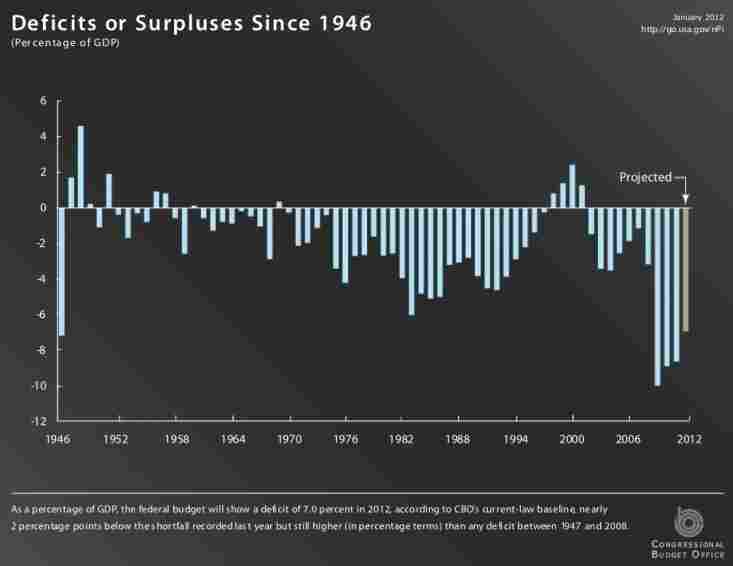 If they expire, the deficit could hover around 2 percent of GDP by about 2015. 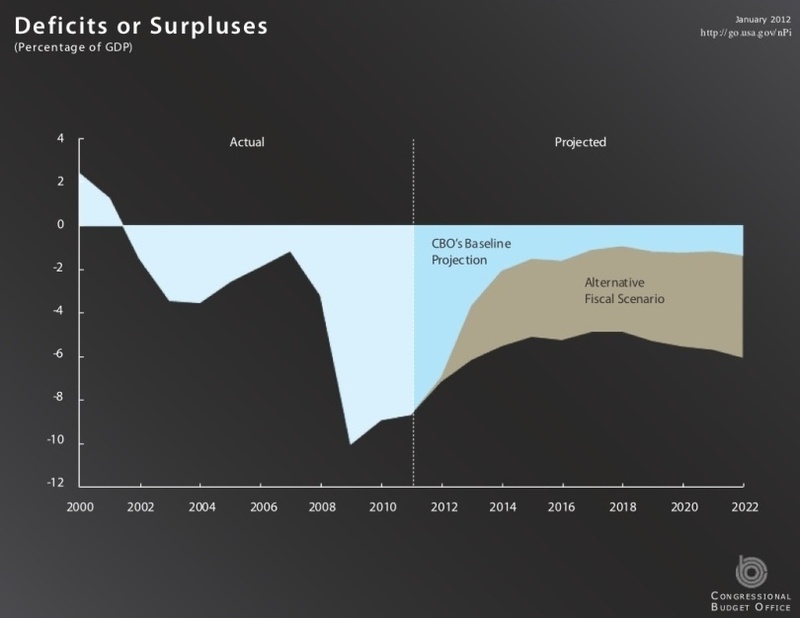 It's also important to note that these numbers are based on the CBO assumption that the economy will remain sluggish, with the GDP growing at a 1.4 percent rate this year to a 2.5 percent in 2022. -- "The Social Security Disability Insurance trust fund will be exhausted in 2016. The Medicare hospital insurance trust fund will be exhausted in 2022." -- "Revenues are projected to pick up markedly in future years. Total revenues to jump from $2.3 trillion in 2011 to $3.7 trillion in 2015. That's the equivalent of going from 15.4% of GDP to 20.2% of GDP." -- "If spending cuts and tax increases are allowed to go into effect as required under current law, the deficit will contract sharply to $585 billion in 2013 and $345 billion in 2014."